Born in Edmonton in 1961, Teresa grew up at the Italian Centre Shop, taking her first steps in the pasta aisle. By age 13, she was working in the store regularly as a cashier, never dreaming she would one day ascend to the Presidency of the company. 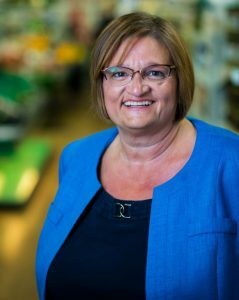 With her vision of changing the business from a local grocery store to a major importer and distributor, the company has grown 8 times with 4 stores (located in Edmonton and Calgary), over 500 employees and sales exceeding 70 million. As an Italian-Canadian, Teresa Spinelli was raised with strong Italian values of family and community, which she brings into her role as the President of a chain of Italian Food Stores. Listen in on how she combines her love for people and food to create a culture where the language of love is great food. Teresa’s customers feel connected to her because they watched her grow up in the store. From taking her first steps in the pasta aisle to working as a cashier at age 13, her life has been greatly influenced by the Italian culture, food and people at the store. As a child, she really wanted to accompany her father on a particular hunting trip he was taking. When he said no, she resolved to become such a fun person that no one would ever turn down an offer of a trip with her. She brings that heart and passion into her work even today. Teresa was greatly influenced by and grew up in an inner-city Italian community. Italian was her first language; in fact, she couldn’t speak any English in Grade 1. However, the strong bond she had with her family members and the abundance of both love and food in her home stood in stark contrast to what her classmates experienced. They weren’t as fortunate as her, but visiting her house and listening to her talk fondly about her family opened up their eyes to different possibilities. Recently, a high school friend reconnected with her and spoke of remembering her pantry being full of meat, and her house, full of love. “Some people come back and connect with you, and you don’t expect it,” she observes. Teresa has always liked people, and is a self-confessed people person. She was born with a sense of wonder – looking to learn new and different things with an open mind. She had to learn to be persistent as a necessity to run her business. However, she has a wonderful team and she notes, “I give them opportunities to grow and motivate themselves.” She has developed the capacity to see people’s talent and become willing to let them have some room to grow. She learned that she “should listen to them because they do the job every day.” She works to empower them and provide them with the resources to succeed in their roles. She takes her employees’ suggestions seriously so they know that they can make a difference. Teresa learned that her family’s way of doing things was different from what her friends from other cultures understood as normal and acceptable. When Teresa once brought a high school friend home, her mother was taken aback at learning that she would be moving out of her house soon because she was turning 18. Italians live with their parents till they get married and some even after. Her mother was heartbroken because she didn’t think it was right that Canadians move out for financial independence. Another time, when Teresa’s Australian (feminist) friend came to visit, she was aghast at the fact that her mother was fetching her brother olives. Her mother addressed her concerns, “I know you think this is horrible, but I want to explain to you that if my son asks me to get olives, I get them not because I have to but I want to, because I know he’s going to eat them and that makes me happy. So don’t feel bad for me; I’m not forced to or treated badly. I do it because I love him and I want him to eat olives. If I don’t get them, he won’t eat the olives.” That conversation changed the way both women looked at the situation and gave them a fresh perspective. Good employers give employees the task, check in once in a while, but truly allow them the opportunity to achieve the goal – they let them shine! More great insights from our guest! Teresa remarks, “Culture is interesting because everybody is different. As it is a global world now, you have to learn more about cultures.” Italians may like to hug and kiss but maybe Asians don’t because it may not be a part of their culture. Learning the aspects of different cultures, asking for permission before acting, and not taking offense or misunderstanding another’s actions are all ways in which we can appreciate and accept each other more. At the Italian Centre Shop, the atmosphere of family makes people from all cultures feel welcome. “It doesn’t matter what colour or race you’re from – as long as you love people, you’re welcomed here”, says Teresa. E2: Grandmother’s Rule: Always Do The Right Thing with Anthony King.